I think, looking back, we’ll see 2014 as a pivotal year in the growth of the metaverse. This was the year that early adopters realized that virtual reality was on its way, the hypergrid came into its own, Google Plus became the social platform of choice for metaverse residents, the Kitely Market proved itself. When I was a kid, I used to dream of being able to walk into fairy tales and cartoons — to actually become one of those characters. Kind of like the scene from Mary Poppins, below. Or any movie where a real-world character becomes animated. Like The Phantom Tollbooth, or my favorite, Enchanted. Or the entire movie Tron. Virtual reality allows us to actually do that. I’ve tried out the Oculus Rift headset and it was amazing. It was exactly what I’ve been hoping for — and can’t wait to use it with OpenSim once the consumer version is out. And I’m not alone. In March of 2014, Facebook paid $2 billion for Oculus VR. In June, Google jumped into the game with a headset made out of cardboard. At first, people thought it was a joke, but more than half a million people have tried one on, and several manufacturers got into the business of making them. In fact, there is now quite a variety of virtual headsets hitting the market, as well as accessories and peripherals. We have a whole section of the website — the Hardware Department — set up just for these stories. And that’s just the beginning. 2014 was the year of the 3D video�and�the 3D marketing experience. Not to mention two different virtual reality viewers for Second Life and OpenSim — the official Oculus Rift-enabled Second Life viewer and the CtrlAltDel viewer. In the OpenSim world, the big story this year was the hypergrid. Increased stability and ease of use, as well as new security features and a multi-grid marketplace with the Kitely Market, all combined to drive traffic to the hypergrid-enabled grids. 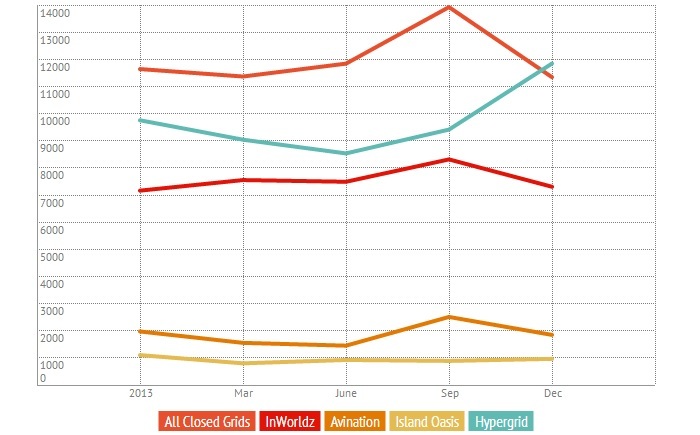 In fact, several�grids which were previously closed turned on hypergrid connectivity last year, including Kitely,�3rd Rock Grid, Tangle Grid and Spellscape. In fact, the number of active users on the hypergrid-enabled grids actually surpassed those on the active grids in December. Two other factors also helped the hypergrid take off: the Kitely Market, and Google Plus. Kitely turned on hypergrid delivery of content on the Kitely Market in March. Individual merchants could then decide whether they were selling content just for Kitely’s local users, or for anyone on any OpenSim grid. A few merchants made their content exportable right away, while others hung back and waited to see what the results would be. By the end of the year, the verdict was in — hypergrid delivery means that users who previously had no access to legitimate content were now able to buy it, and they had money to spend. Wayfarer, owner of the�Worlds End Landscaping & Roleplay store on the Kitely Market, was one of the leading merchants on the platform, confirmed Kitely CEO Ilan Tochner. 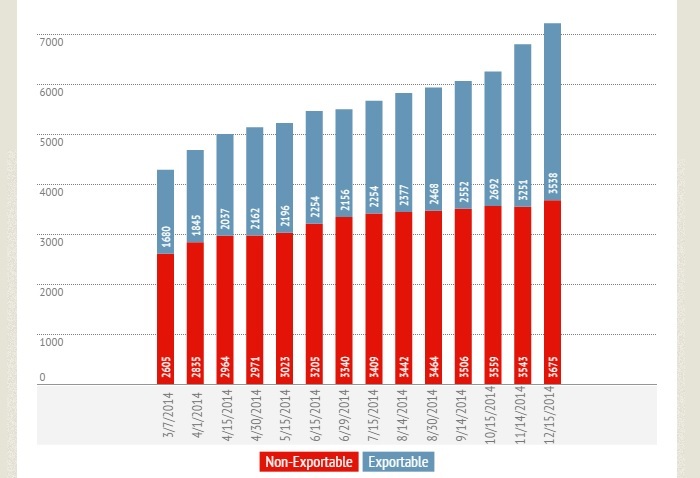 During the last quarter of 2014, exportable items on the Kitely Market grew at several times the rate of non-exportables. Google dropped its real names policy in July, and OpenSim users flooded in to its Google Plus communities, which also offered convenience, usability, Google Calendar integration, and other features. 3rd Rock Grid, Alexander City, Arts in Virtual Worlds, AuroraSim/WhiteCoreSim, Avatar Repertory Theater, Avatar Safe Haven, Avination, AviWorlds Grid, Baroque Roleplay in Opensim, Content creators of the virtual worlds, Craft World, Firestorm on Opensimulator, Francogrid, Friends of Arcadia Asylum, Gamification of Opensim Community Development, Hypergrid Destinations, Hypergrid Events, Hypergrid Roleplay, Hypergrid Safari, Inworldz, Island Oasis,�Kitely Virtual, Littlefield, Lost World Grid, Metaverse Week in Review, Metropolis Metaversum, New Opensim,�New World Studio, OpenSim Advertise, OpenSim Bloggers, OpenSim Creations, OpenSim Destinations For Educators, OpenSim Medieval Roleplay, Opensim Resources, OpenSim Vehicles, OpenSim Virtual, OpenSimulators Gridcache, Opinion Outpost, OSgrid.org, Sanctuary, Second Life and other Virtual Worlds, Selea�s World,�The Adult Metaverse, The Next Reality Grid, Virtual Highway, Virtual Identity, Virtual Pedagogy, Virtual Worlds News and Gossip, Virtual Worlds Stats, and�VirtualmintaKa. The chart below shows the ten with the most users. 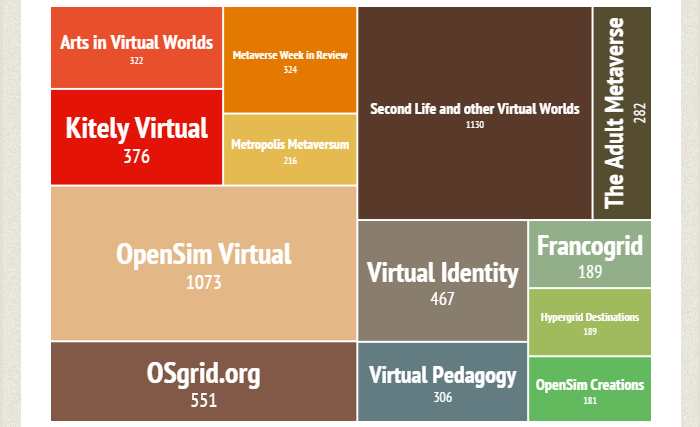 Top ten Google Plus communities for OpenSim. My personal favorite communities are OpenSim Virtual�and Hypergrid Destinations. I’m a member of both, and get an email each time there’s a new post or comment. In mid August, the largest and oldest open grid went down. OSgrid was the crossroads of the metaverse, the testing ground for OpenSim development, and the first stop for many newcomers to OpenSim. Open grids are those that allow users to connect home-based regions, or regions running on their own servers. 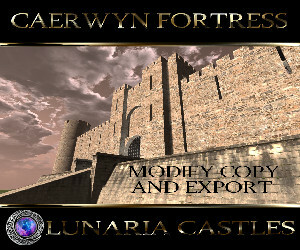 OSgrid in particular was popular with hobbyists running OpenSim at home, with educators running OpenSim on schools servers, and with third-party hosting providers like Oliveira Virtual Lands,�MA Rentals�and Katronix Serf, which have been struggling since OSgrid closed. It’s now January, and the grid is still down, and there’s no word about when it is coming up. Grids and blogs put up donation signs in support of OSgrid. The outage was marked by a total lack of respect for the OSgrid residents, some of whom relied on OSgrid for educational projects, for their social connections, for their creative outlets. Did the residents want to spend money in order to get the grid up and running faster? Were they willing to do without their inventories for the time being to get the grid back up immediately? �Did they want a temporary grid that they could move their regions to while they wanted for the fix? Instead, the administrators communicated with their residents in dribs and drabs. A Tweet here, a Facebook post there, an announcement on the�grid’s news page, a conversation on the grid’s chat channel, a post in the forums. 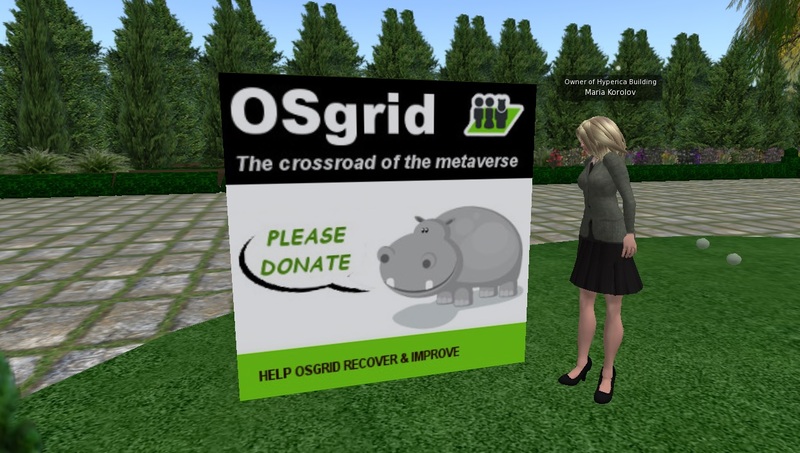 Meanwhile, residents — and even other grids — donated money to OSgrid to help it get back on its feet. There is currently no viable alternative to OSgrid. Sure there are other open grids — Metropolis, FrancoGrid, Craft, WestWorld, Atek�Grid�and Refuge Grid�being the leading ones. But some are�known as regional grids, others are�affiliated with individual companies, and none have been endorsed by OpenSim developers the way that OSgrid has been. There is still a population of people in the metaverse who are waiting for OSgrid to come back.